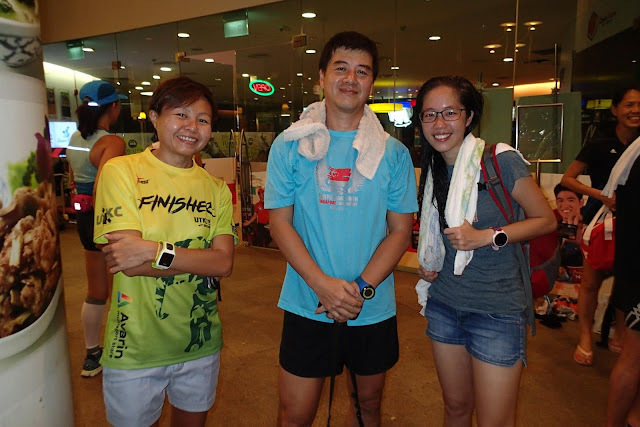 3 hours before the start of the second Sundown Marathon Lead Up Run at The Playground, there was a heavy downpour island-wide, especially heavy in the East Coast area where we were expecting more than 300 participants for long pace run. 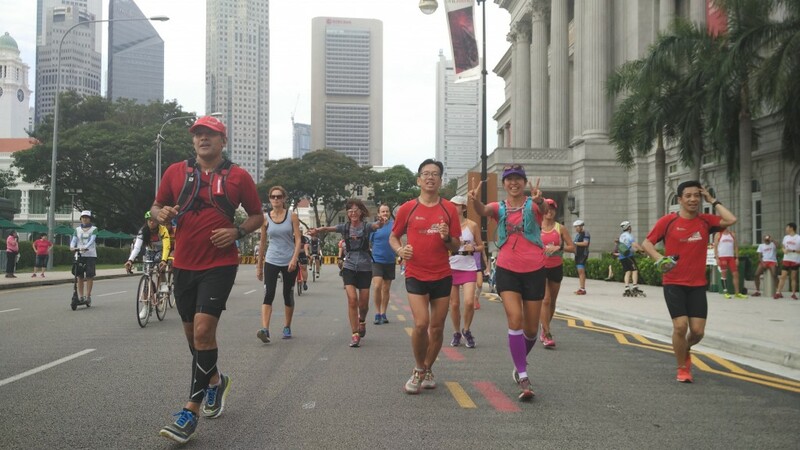 We kept our fingers and toes crossed, and we were blessed with clear skies at 4:30pm for the long run of 14km and 26km to get underway. 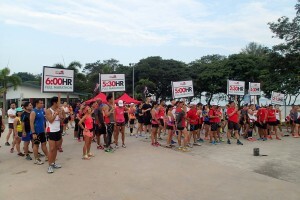 More than 200 runners made their way in time for the 5:00pm registration and promptly issued light bands and sticks for a ‘happening’ night conditioning run. 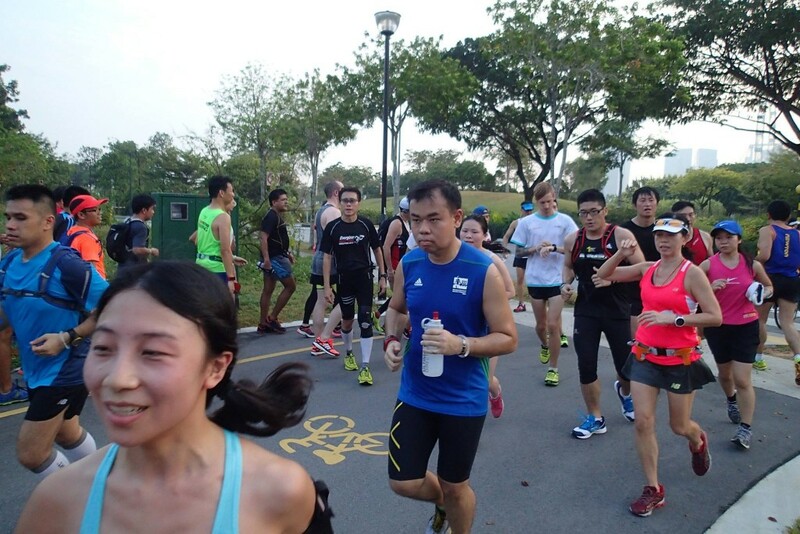 Water points stocked with iced-cold isotonic drinks and mineral water was ready for the Sundown Runners at Car Parks C4 and F2. 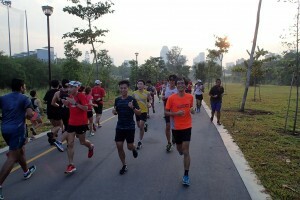 The Official photographer was busy snapping photos of the runners and pacers, including the briefing and dynamic warm-up drills sessions the Pacers took the Sundown Runners through. 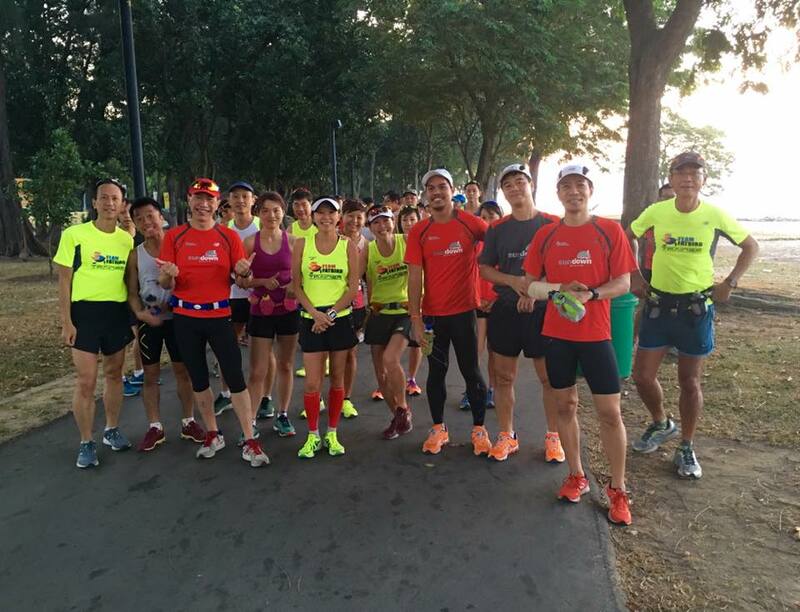 The NightHawks who were into their 6th week of structured marathon training with Team FatBird was also lined up alongside the Sundown Runners for their buildup long run at Marathon Pace (MP). 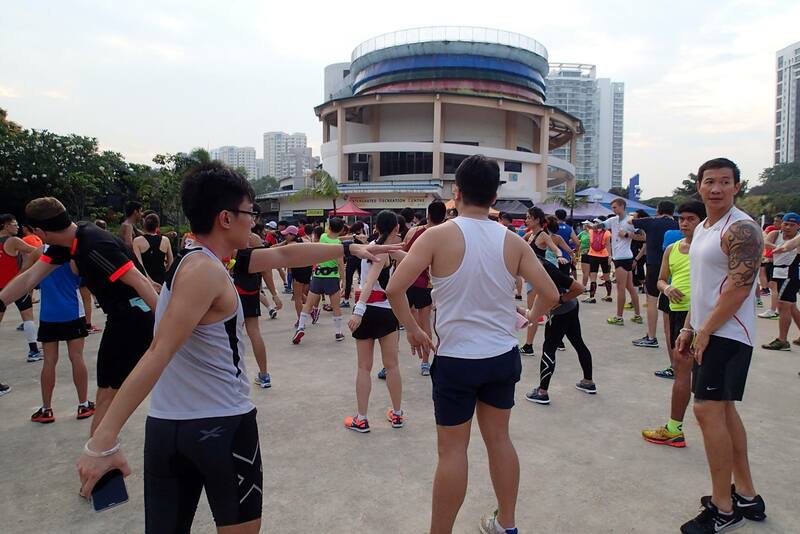 The 10min dynamic warm up set the runners into the right mood and blood pumping to the music carried by the Pacers. 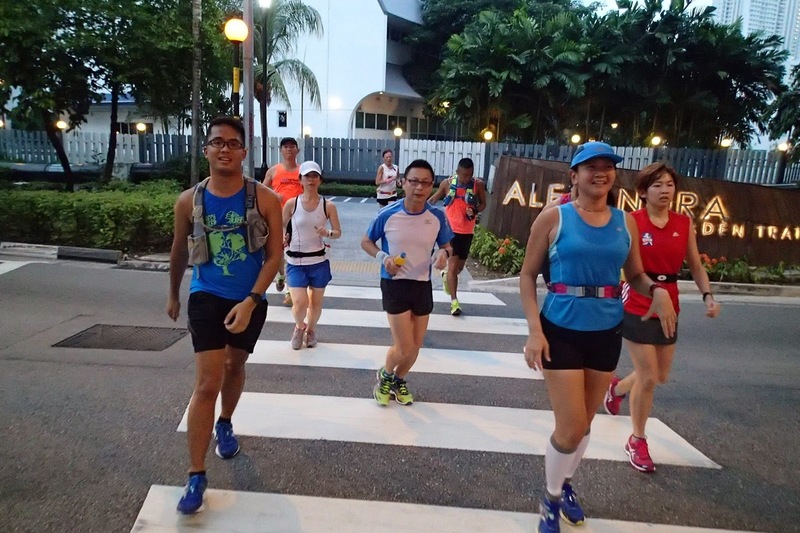 neat and impressive, running to a certain tempo and carrying an impressive aura about them as they strode their way down towards Fort Road and then the access road leading to Gardens By The Bay (GBTB). 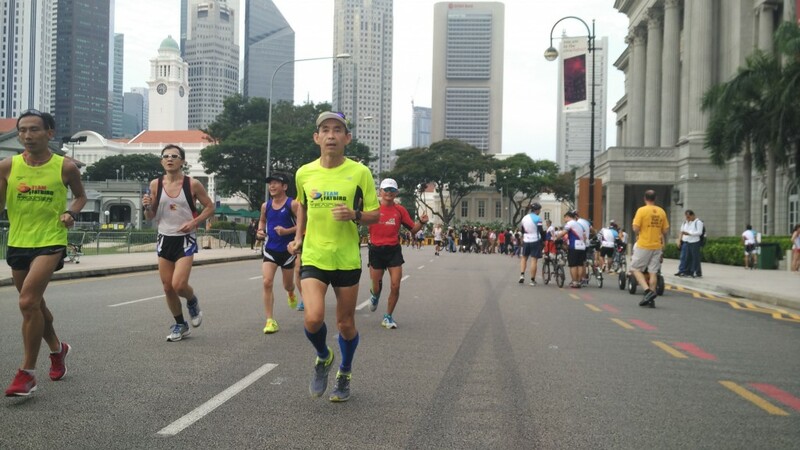 The skies were still bright when we turned back just before hitting GBTB, and as the various groups of runners passed, loud cheers and blows of the whistles could be heard from the distance. 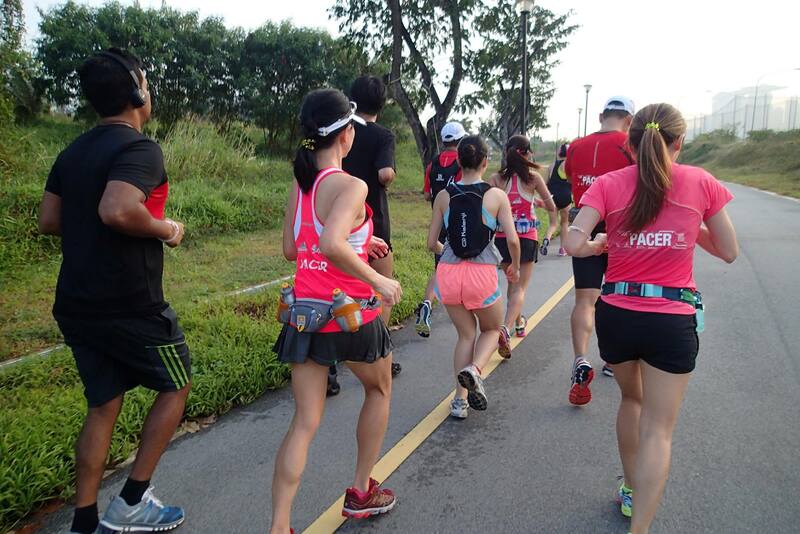 The portable music set the tempo for all of us to keep in step, and the Sundown Marathon Pacers were impressive as they shouted words of encouragement and providing guidance to the runners. 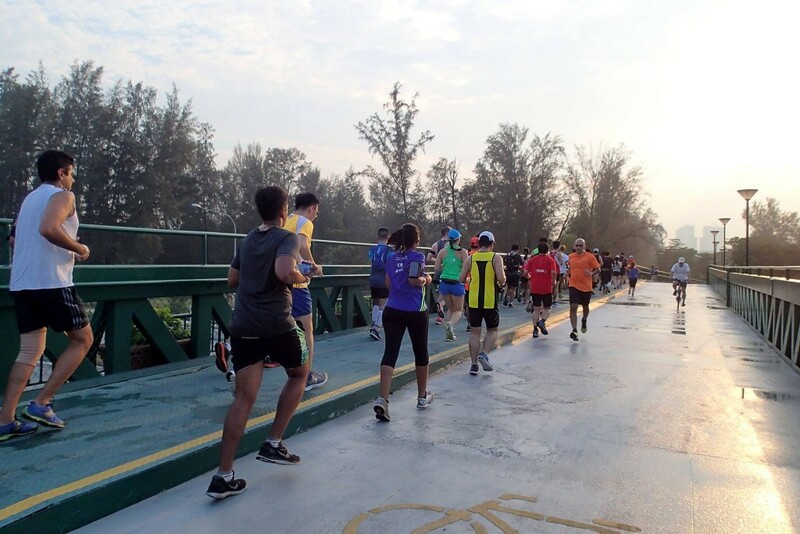 Once back onto ECP, the Pacers led the runners through with songs and shouts of “Sundown Sundown, Ooo Ahhh!” The high spirits of all runners shone through as they found much fun and ease with keeping to the challenging MP through the energy of the group. We made a quick stop at the first hydration point at Car Park C4 Shelter, before the Half Marathon Runners made a U-Turn at the Y-junction just before turning into Cable Ski. 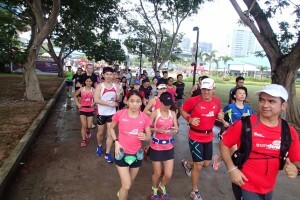 The Full Marathon participants continued on their merry journey towards Sailing Centre and then NSRCC, before making a U-Turn back to home base. 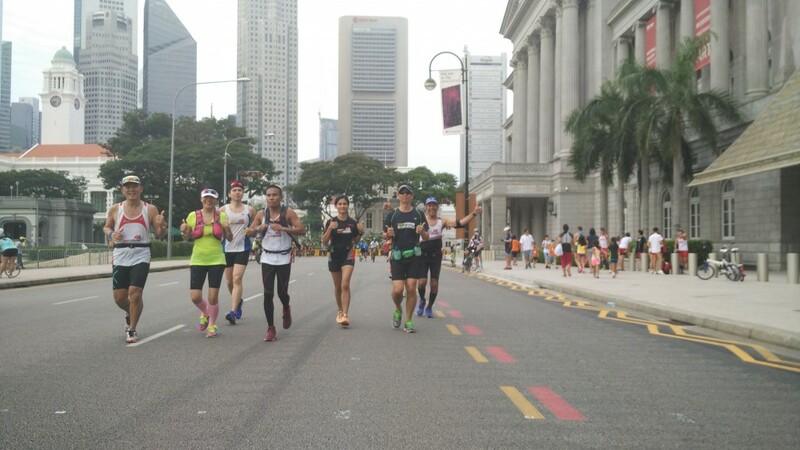 At the 18km mark, a few of the runners felt the strain but were still making good effort to keep up with the main packs who were sustaining MP at easy pace. 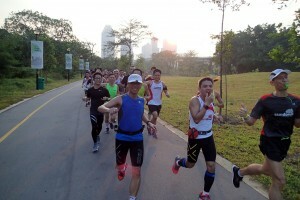 The high energy of the groups kept the runners’ spirits high in spite of tiring legs. 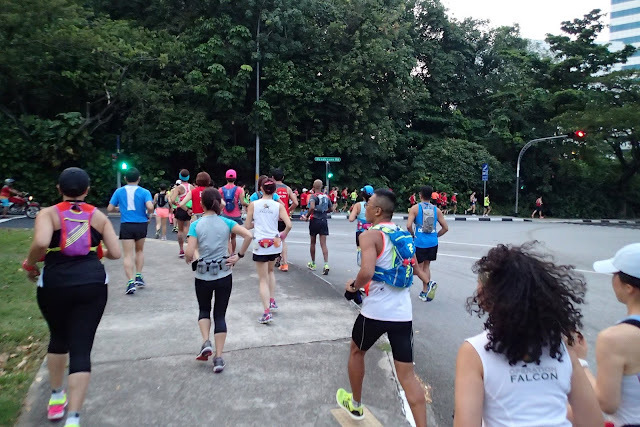 The blinking lights on the runners and pacers looked bright and visually pleasing, which made for easy identification of the running groups from Sundown. 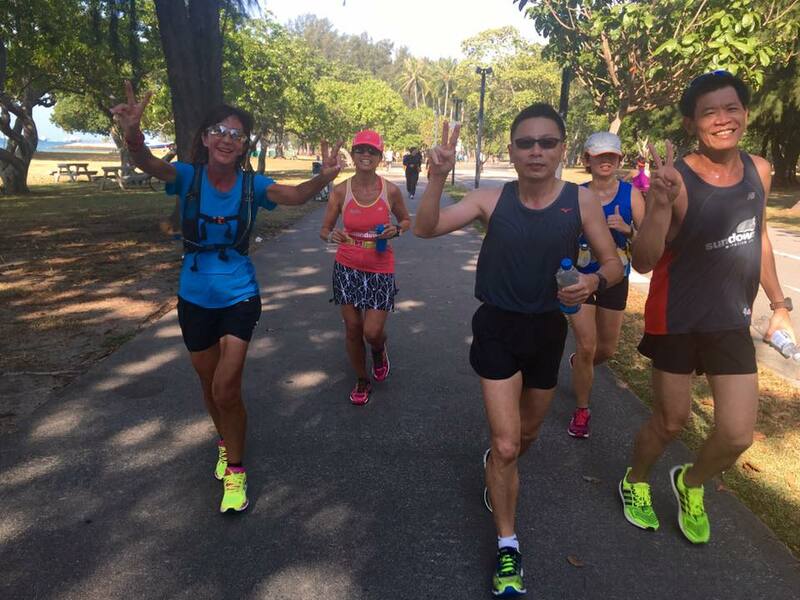 There were cheers of encouragement from holiday makers and families gathered by the sea-side, making the whole run very interesting and motivating for all. 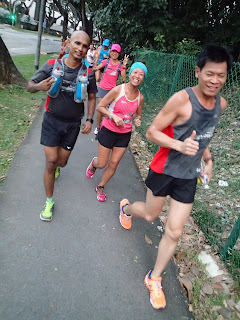 As we neared the end of the run at 14km and 26km respectively, each of the pace groups closed ranks and shouted group slogans and singing songs for some very good shots from the Official Photographer. Although the skies were clear after the bout of rain, the humidity levels remained high, which made this finish for all participants even more impressive. 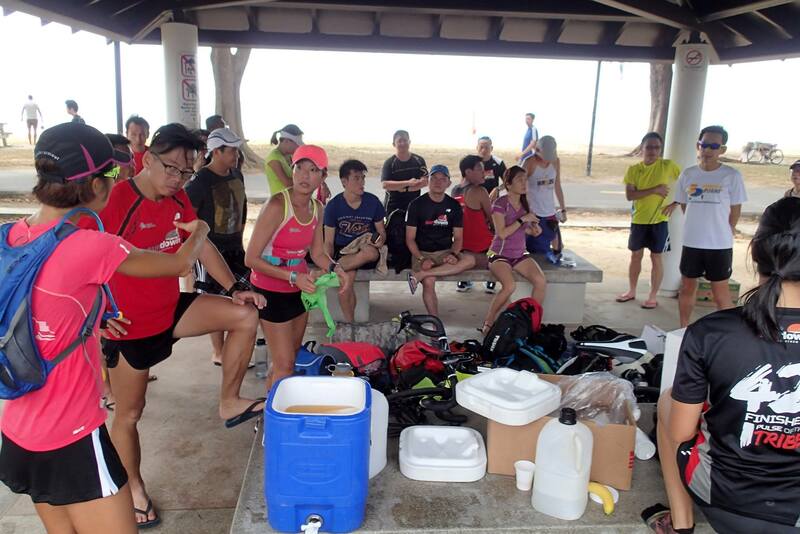 Isotonic drinks and bananas made for great replenishment after the long run, followed by respective group debriefs and two rounds of static stretching to relief those achy muscles, conducted by the experienced trainers from Team FatBird. 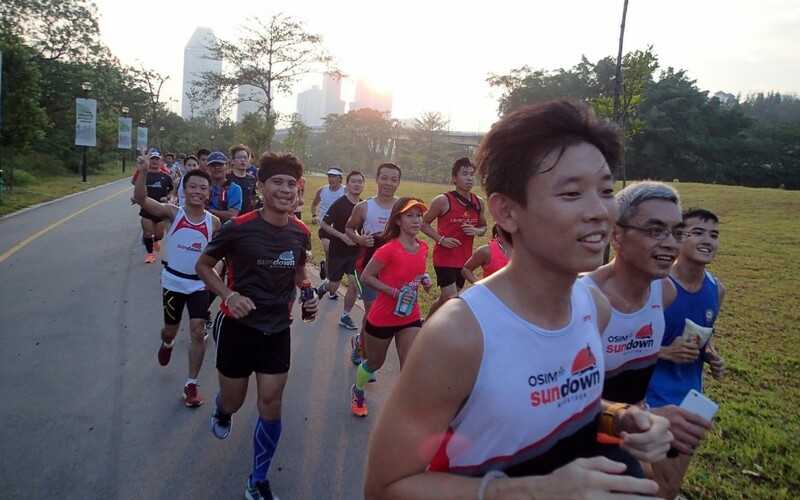 With 2 lead up runs under their belts, the Sundown Runners will keep up the momentum with a few more progressive long runs of their own, before returning for the final installment of the Lead Up Run Series on May 7 with long steady runs of 21km and 32km at Optimal Pace. 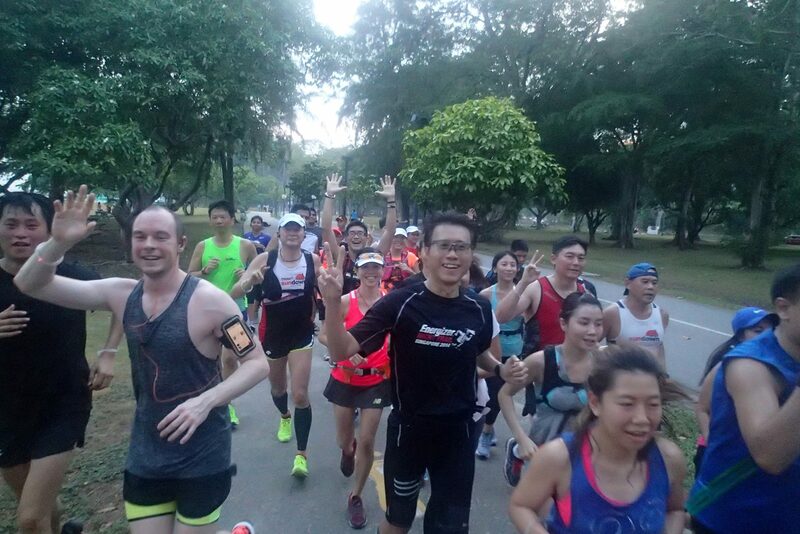 As we bade goodbye to the Sundown runners, there were lots of appreciation and words of thanks from the marathon trainees for the Sundown Marathon Pacers and Organizer, making our efforts in putting the lead up group training runs together all the more sweet and satisfying. 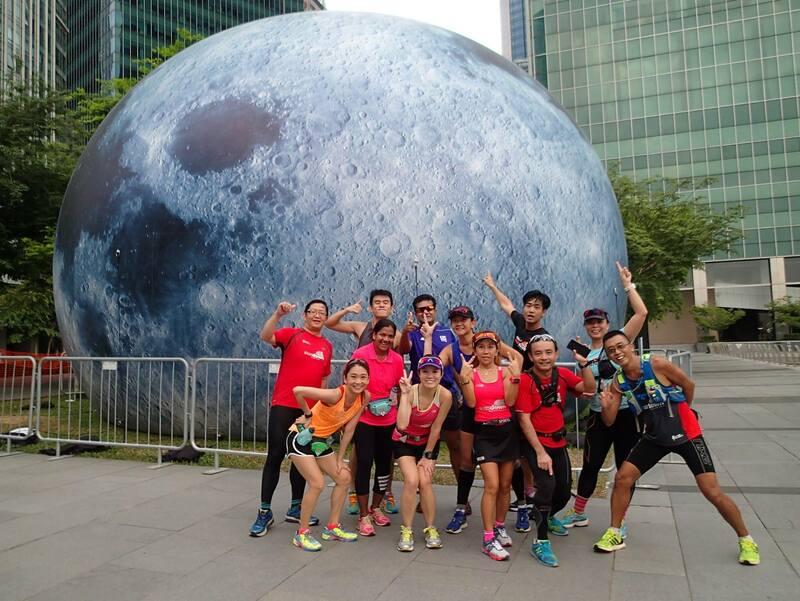 Sundown Runners, You Are Limitless! 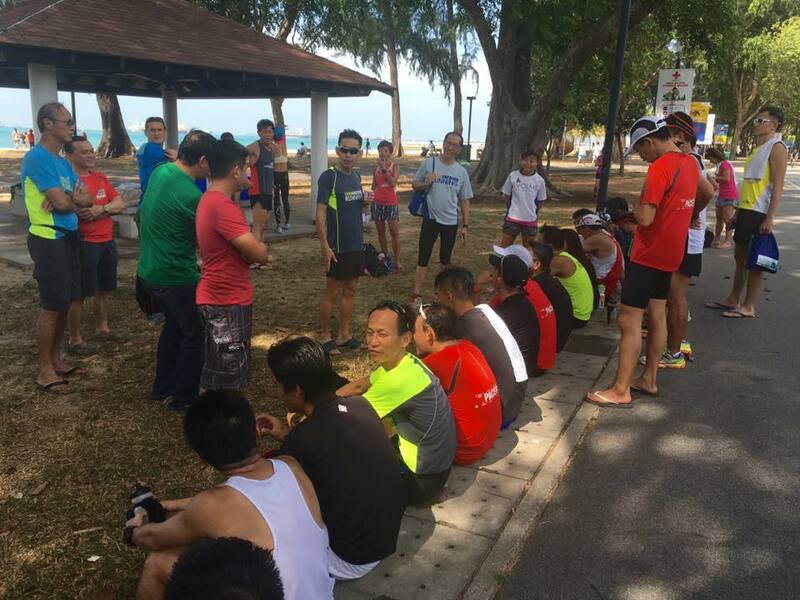 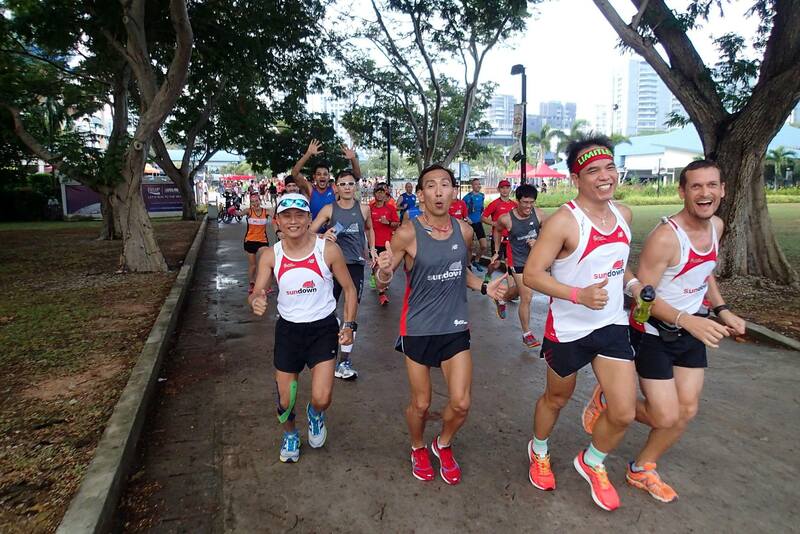 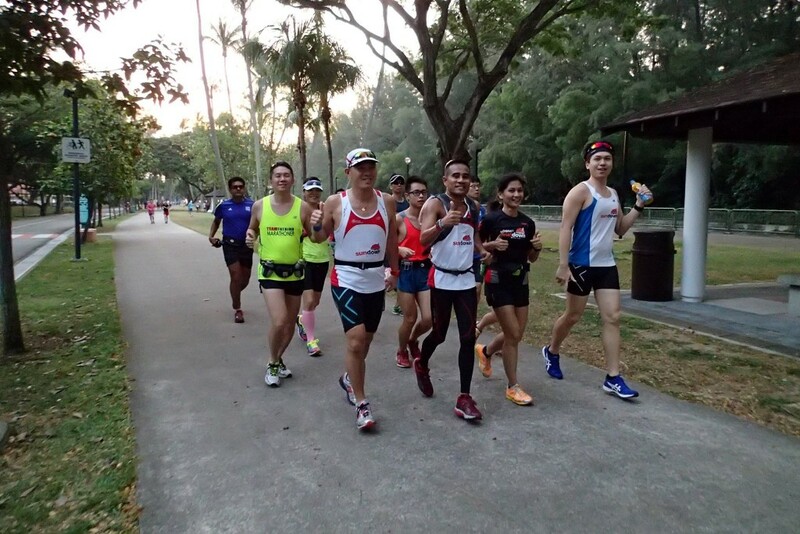 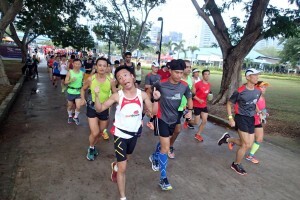 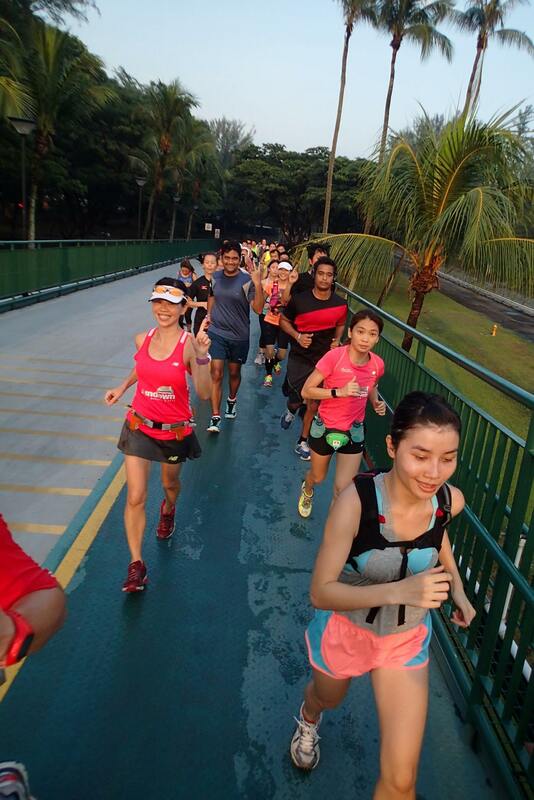 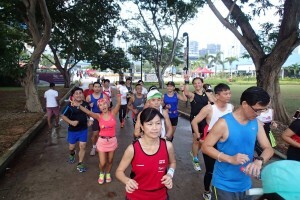 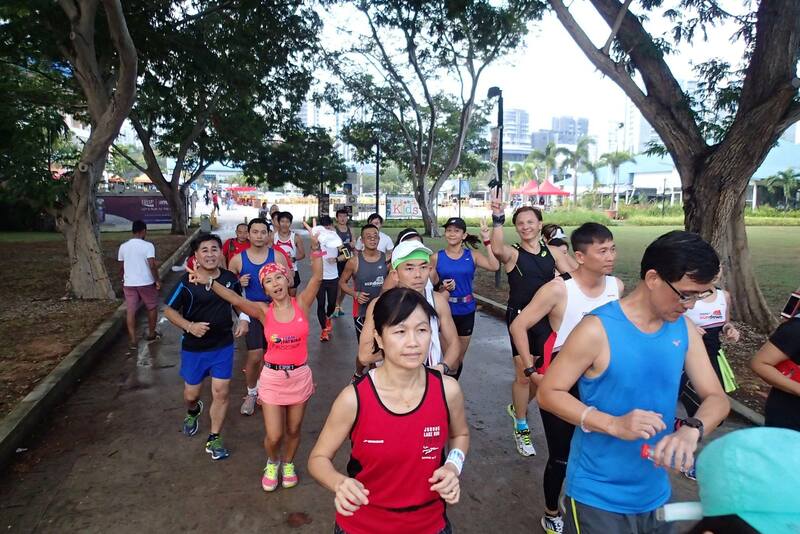 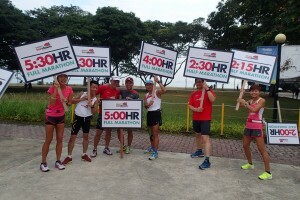 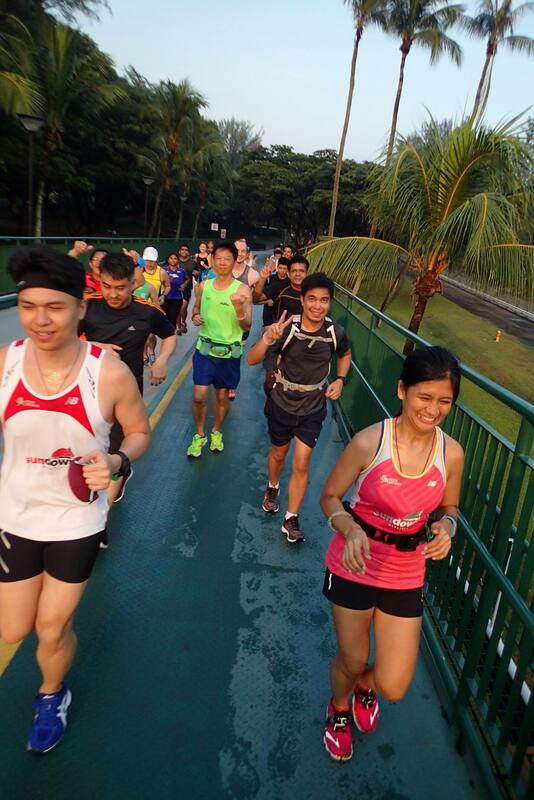 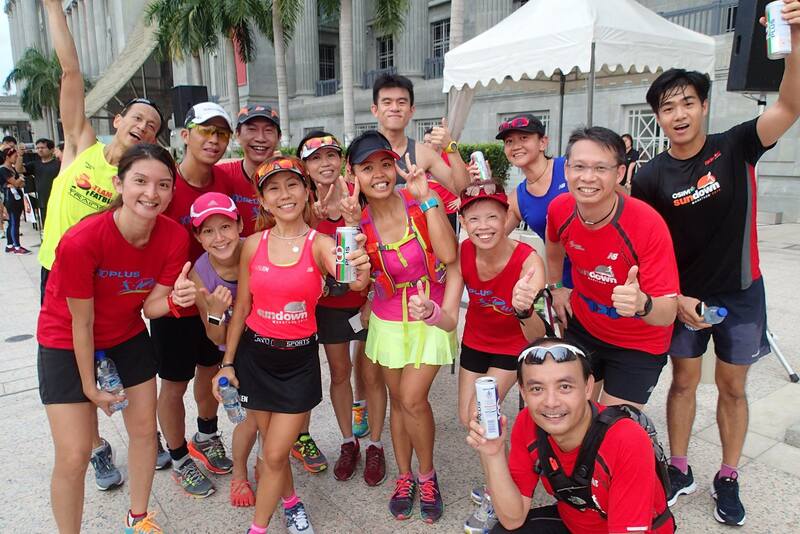 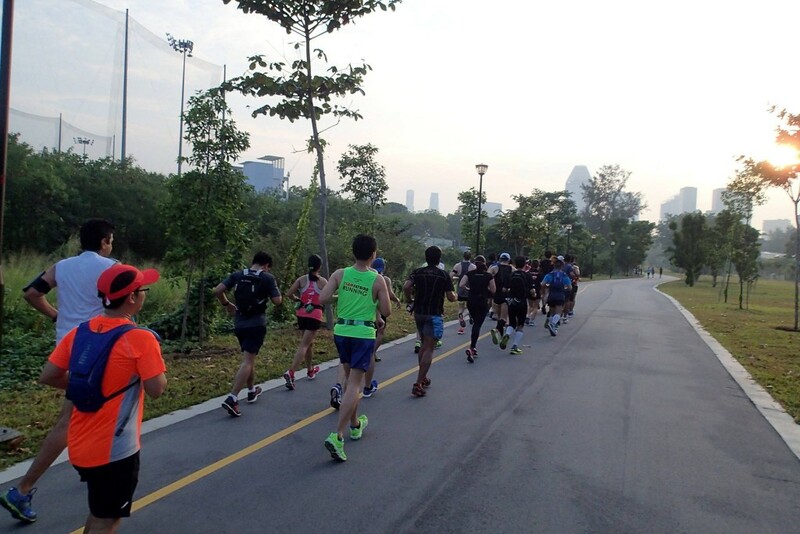 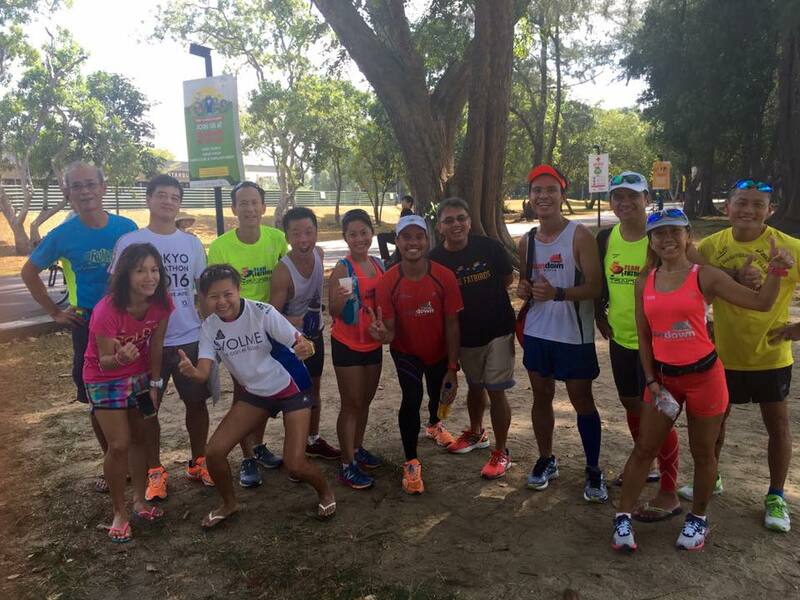 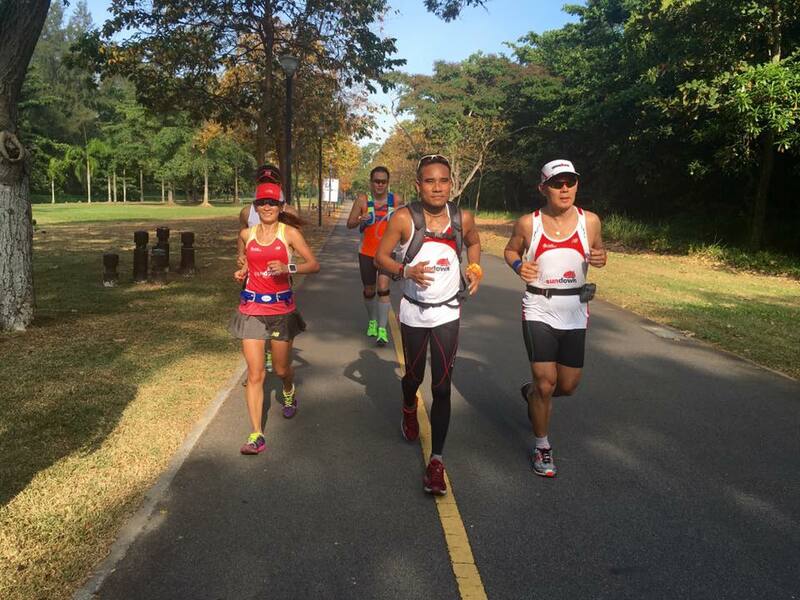 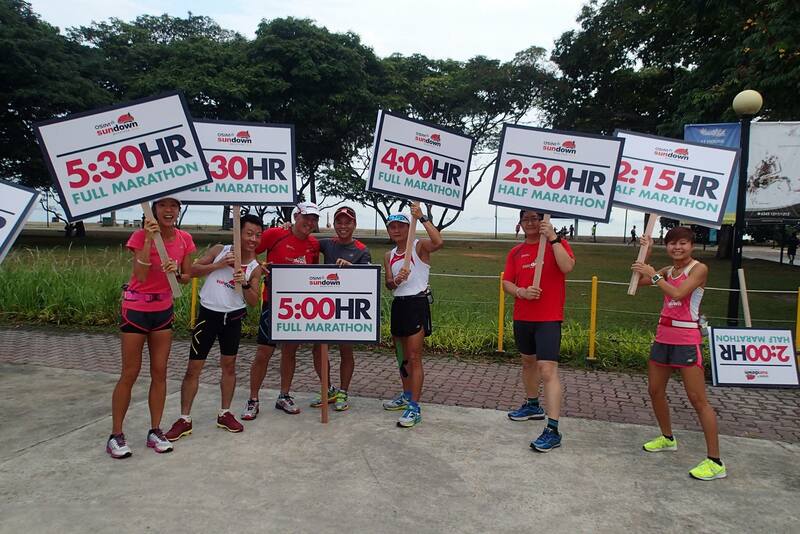 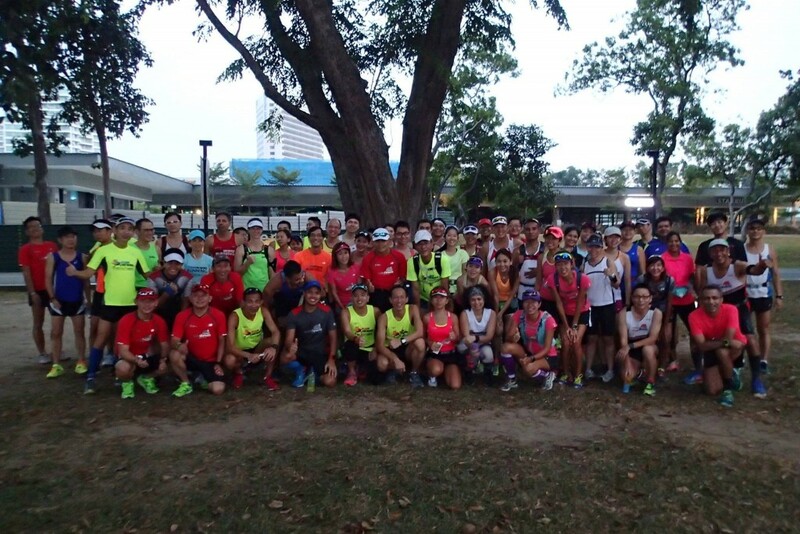 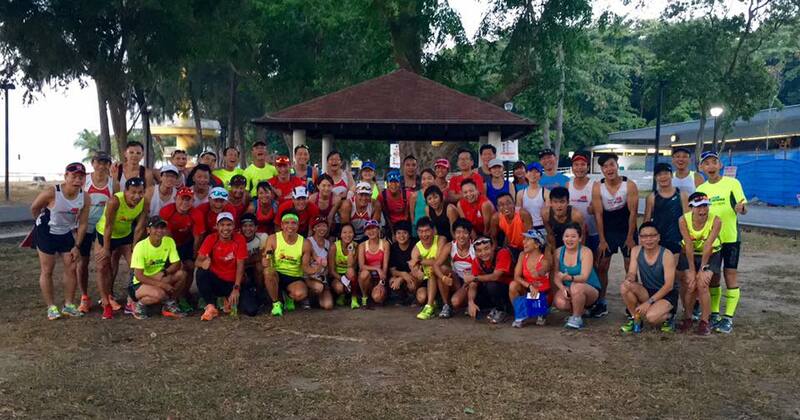 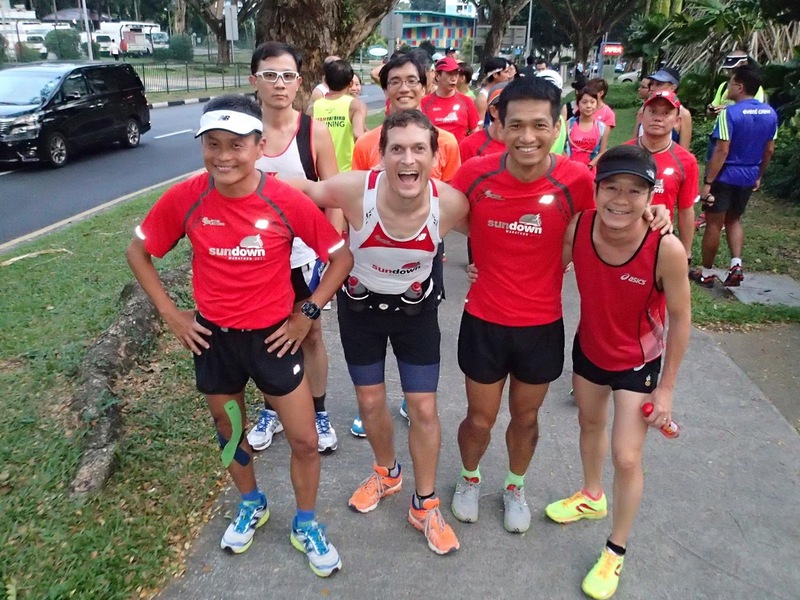 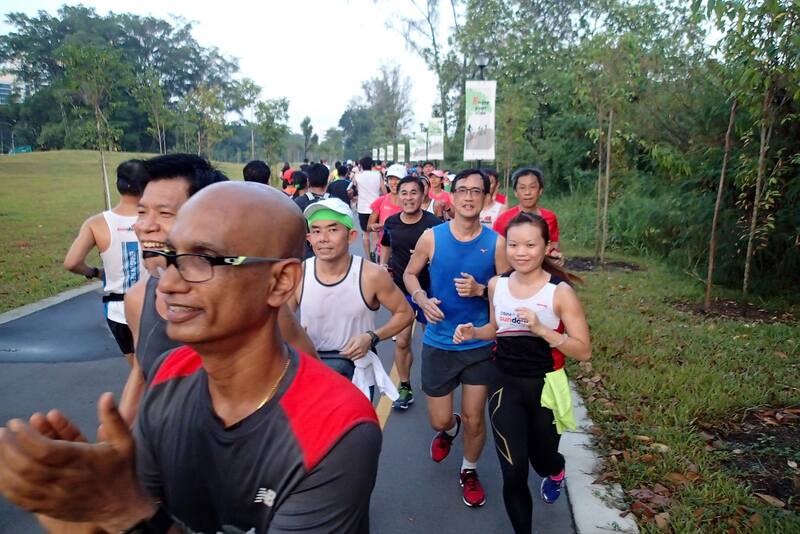 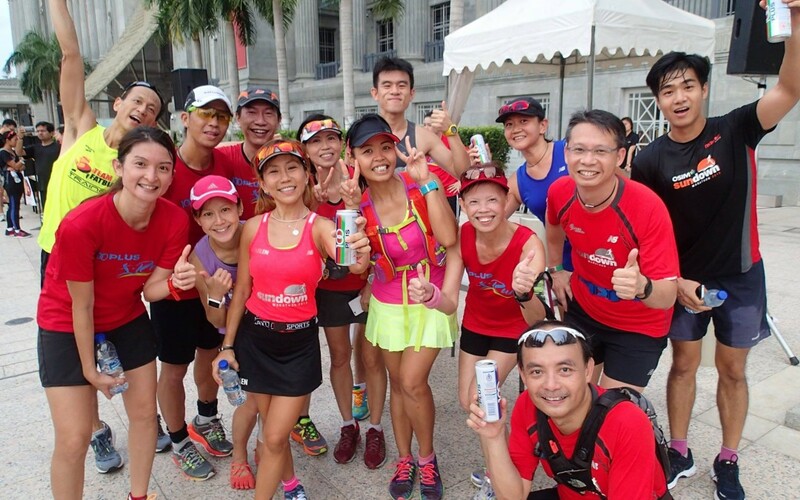 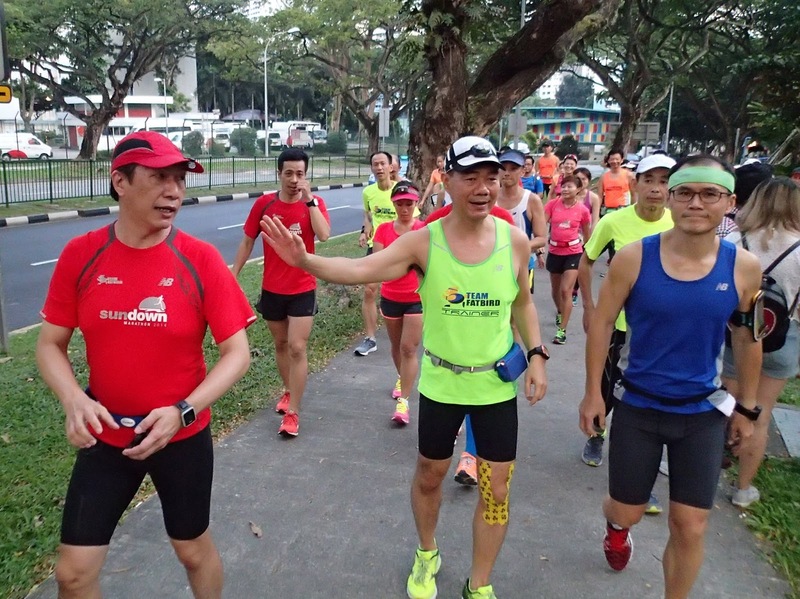 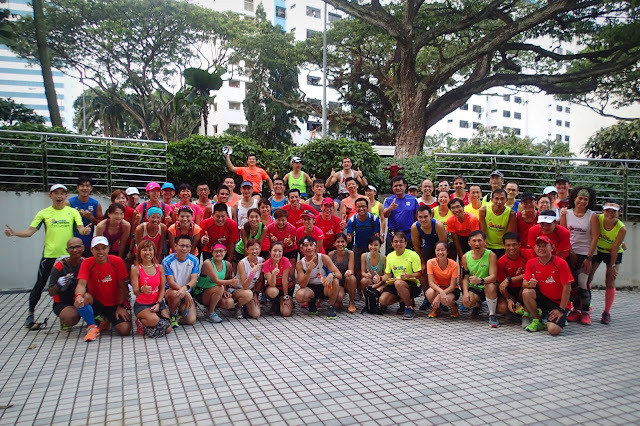 The Sundown Marathon Pacers and NightHawk marathon trainees went into the fifth week of training with a stronger foundation as they tackled 18km and 30km of long steady distance running from Parkland Green, ECP. 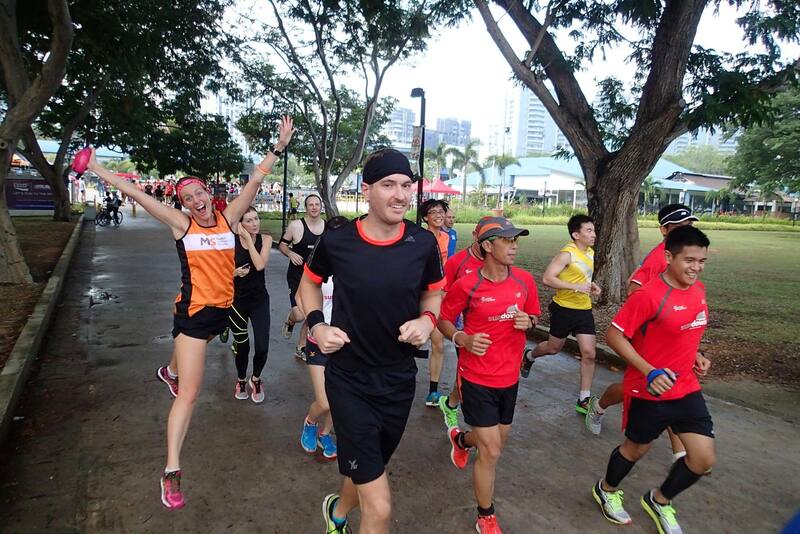 Ahead of the 2XU Compression Run the next morning, there were a few Falcons who turned up for a shorter run. 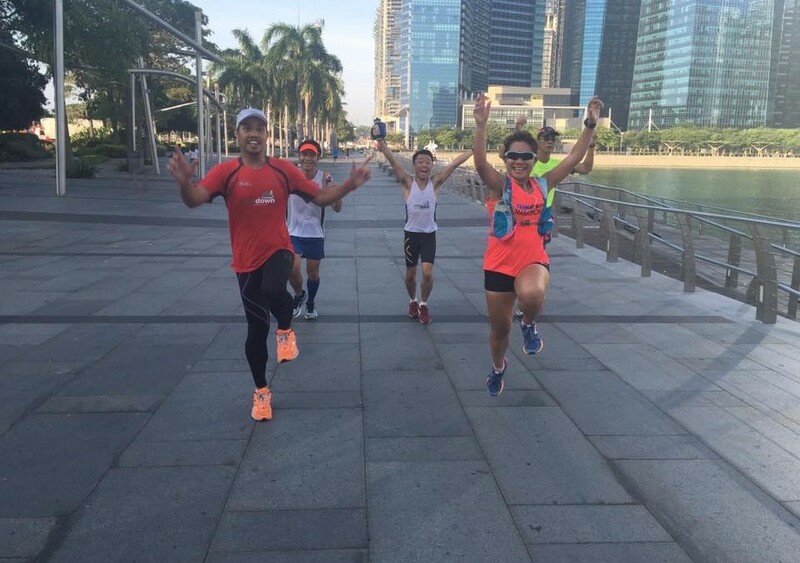 Although a warmer day than last weekend’s training, we were happy to have clear skies after the past few days of moderate air conditions. 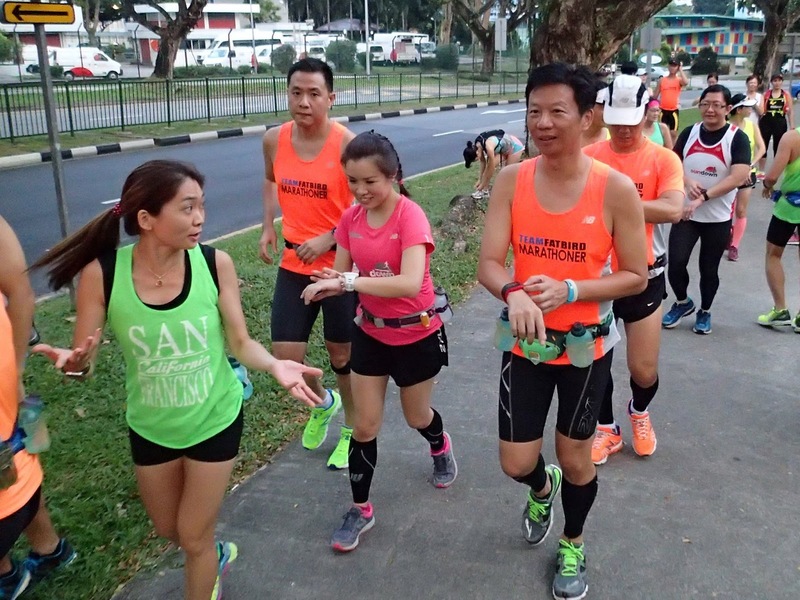 The Sundown Pacers along with the NightHawks were comfortable as they set off in basebuild pace, with the plan of upping to Marathon Pace (MP) in the second half of the run. 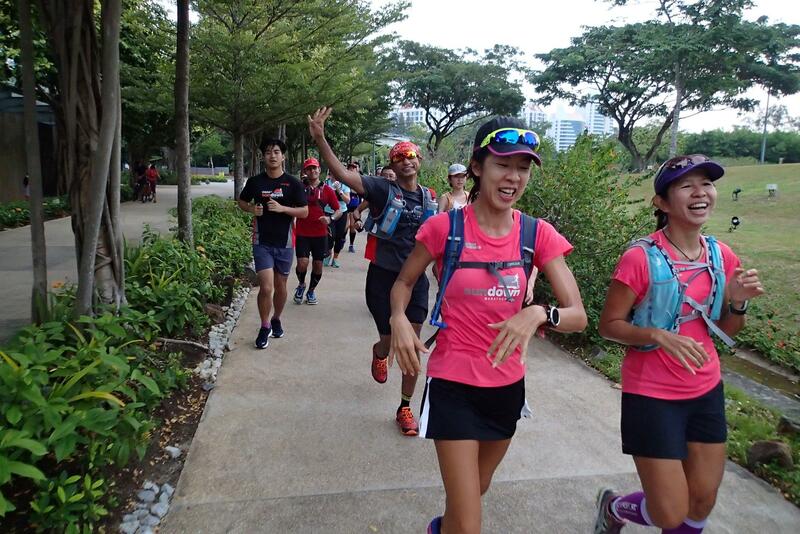 The route towards Fort Road and Gardens By The Bay was pretty clear for some good running as Groups 1 through 4 settled into their Basebuild Pace (BP) and chatted with one another in a Zone 2 FlightZONES effort. 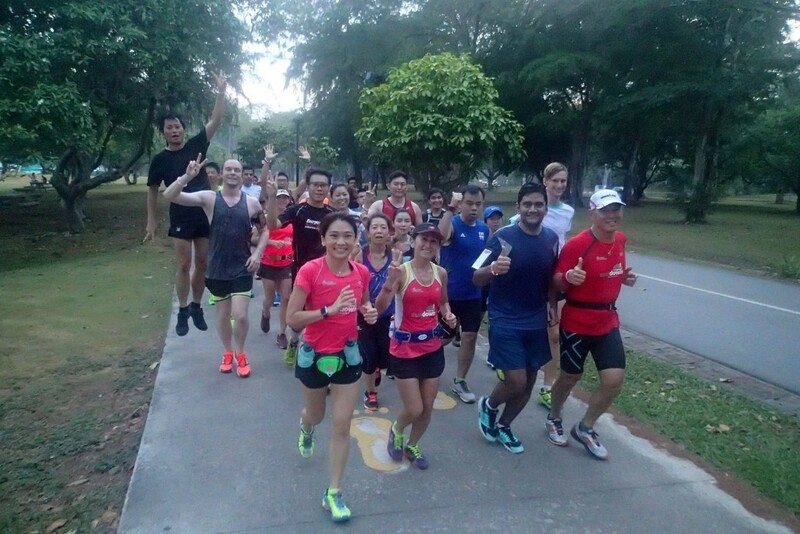 It was great to see the confidence of the trainees growing as they tackled the initial miles with ease and control of their paces. The sun was out in its full glory by the time we hit the Gardens towards Marina Barrage, but that did not affect any of the NightHawks’ momentum. 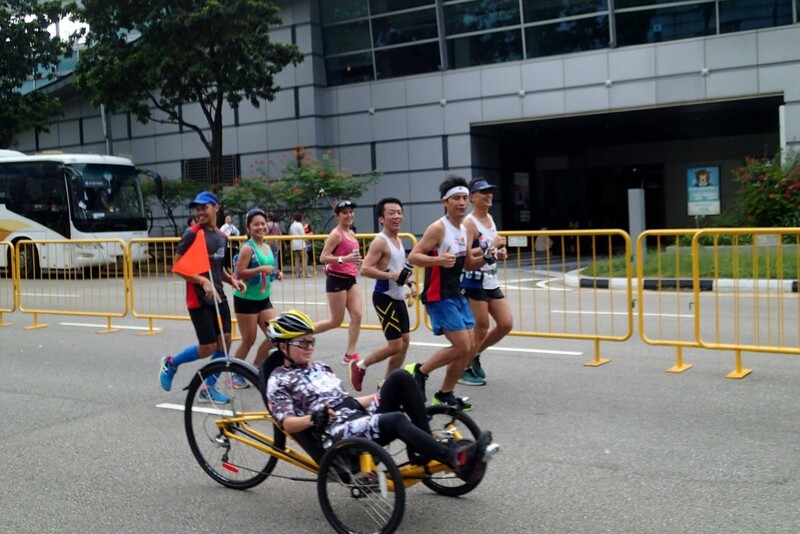 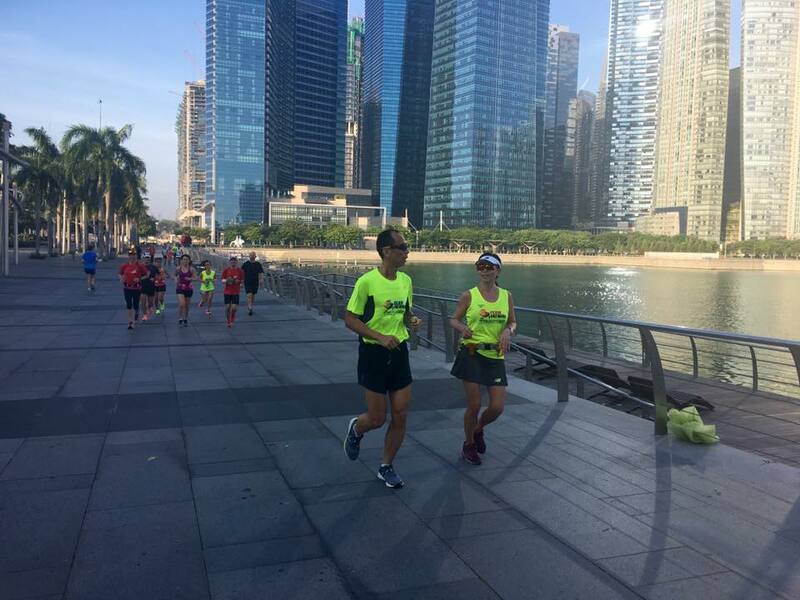 It was always great fun to run along Marina Bay Sands and admire the magnificent skyline of the Financial District, and when we looped back from the Promontory @ Marina, we were able to pass other pace groups, giving us opportunities to cheer and encourage one another. 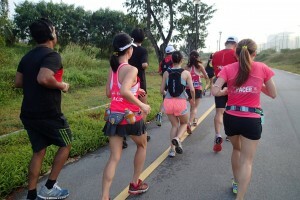 The Half Marathoners finished off back at Parkland Green for 18km, with replenishment of iced-cold Gatorade and bananas. 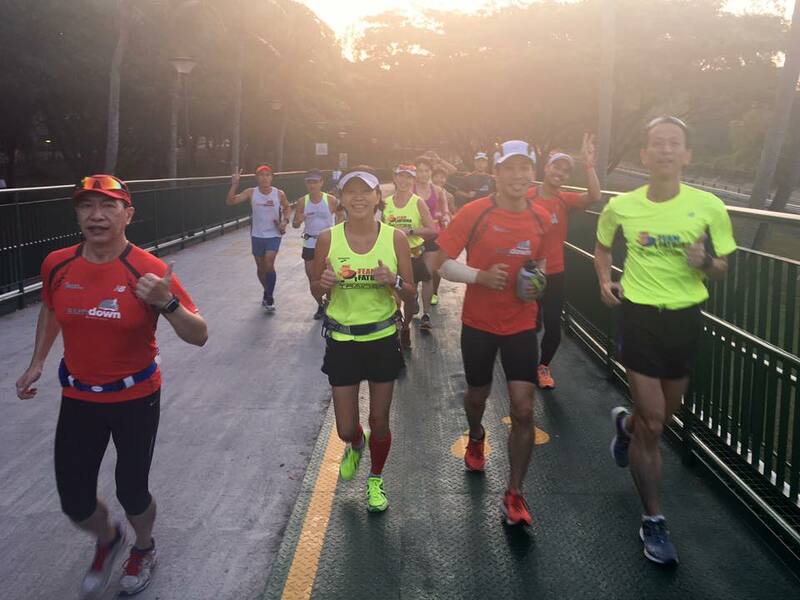 The Full Marathon trainees and Pacers proceeded on towards PA Campsite, and by then have already revved into Marathon Pace mode. 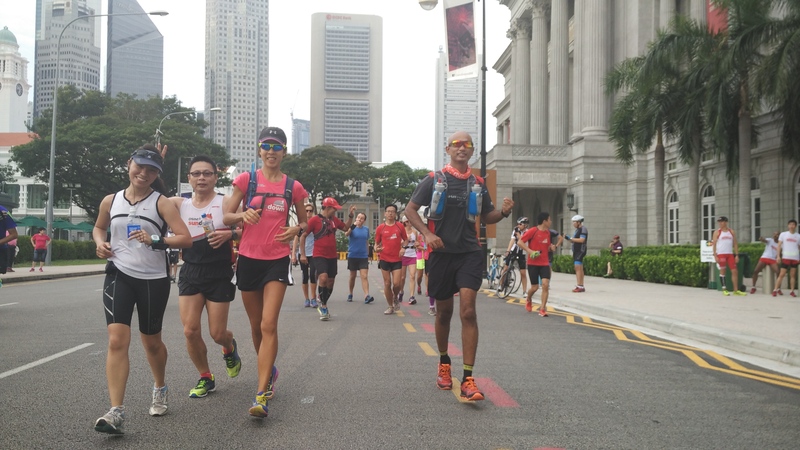 With regular hydration and fuel top-up, the runners were able to maintain the transitioned MP all the way to the 24km mark at a steady pace, and with the groups intact. The remaining 6km was run with more effort, but that was where the marathon training kicked into effect to establish the distance ‘conditioning’ and endurance that is so important for the marathoners. 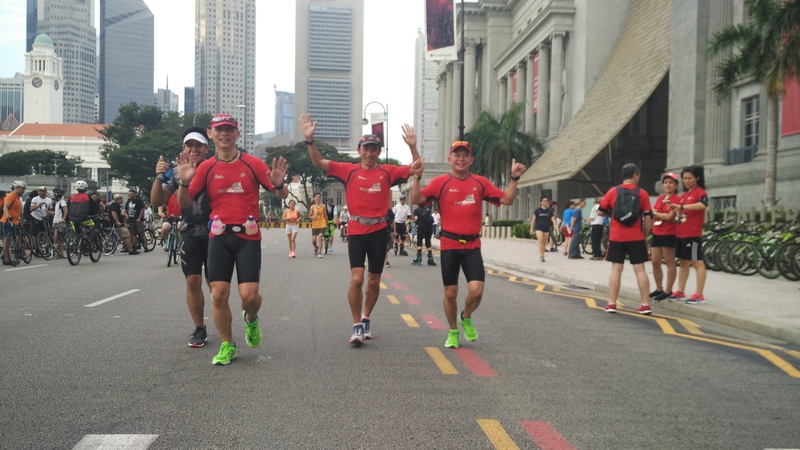 The NightHawks were impressive as they showed little signs of fatigue, soldiering on steadily for the completion of 30km back at start point. Marathon training with Team FatBird have seen a number of trainees with healthy weight loss through progressively increasing mileage, especially at the weekend Long Steady Runs (LSD) sessions. 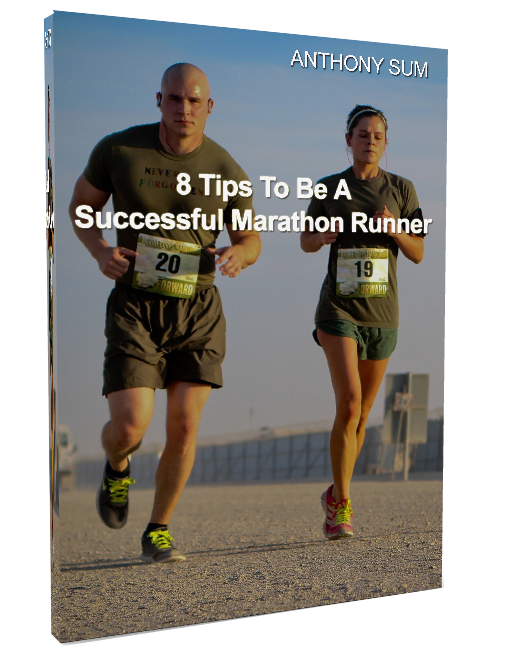 The regular training schedule with marathon tips on heart rate training, nutrition and diets, good running form, active recovery, and strength training programs of hills and speedwork have benefited many runners and trainees in our marathon training programs. 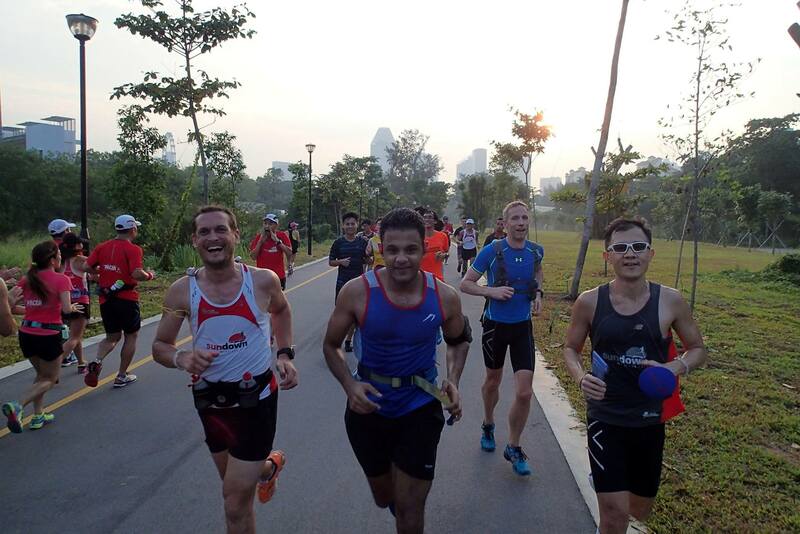 With the foundation phase in their belts, the NightHawks will look forward to putting their strength and endurance at next weekend’s second Sundown Marathon Lead Up Run. 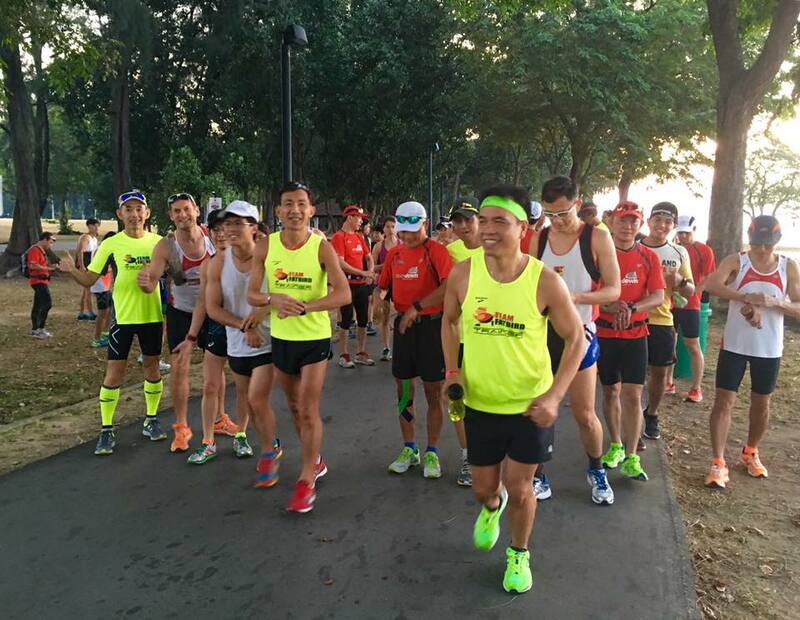 There will be nary a doubt they will run strong and full of confidence along with many runners who have registered for Sundown Marathon at the end of May. 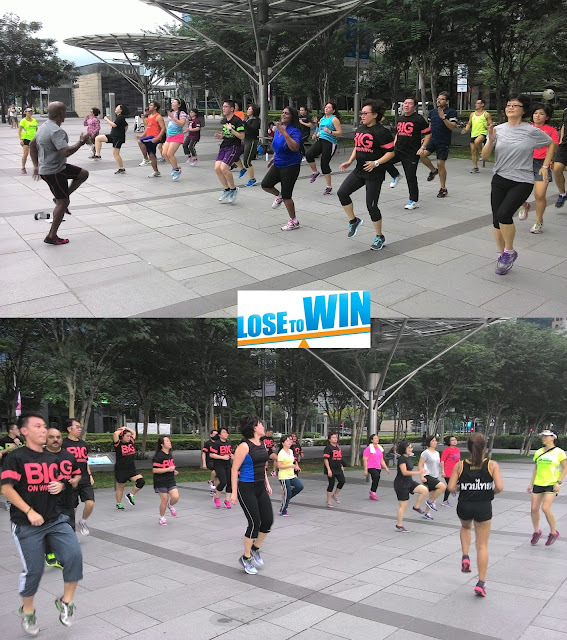 Congratulations To All Team FatBird’s Lose To Win Participants! 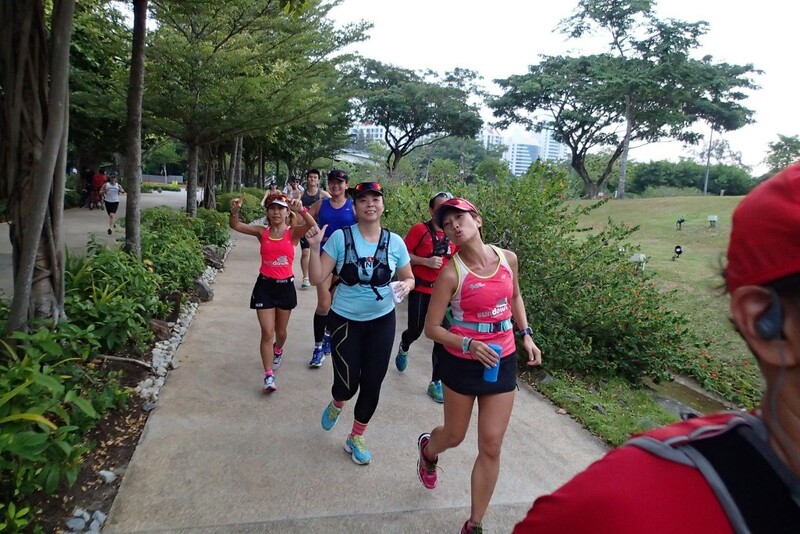 With the help of qualified weight-management experts fromTeam FatBird, this 8-week programme incorporates Nutrition,Well-Being and Fitness Workshops coupled with 8 sessions of strength and conditioning workouts and group exercises will show you how to get into great shape for a fitter and leaner you in 2016! 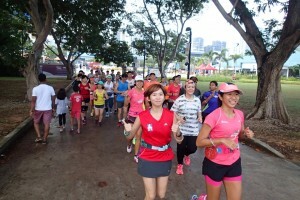 Tan Mei Li (Grp 206)I was tested being pre-obese at 63.4kg before I came for Team FatBird’s weight management program. 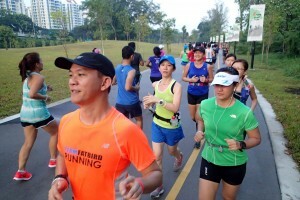 I learnt that regular exercising and proper eating habits were key to my success in shedding 4kg. 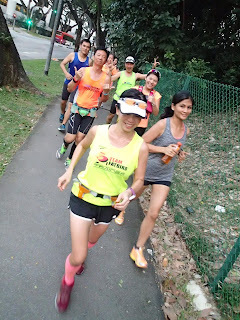 I dedicate my success to Team Fatbird and all its instructors that gave me motivation and positive mindset. 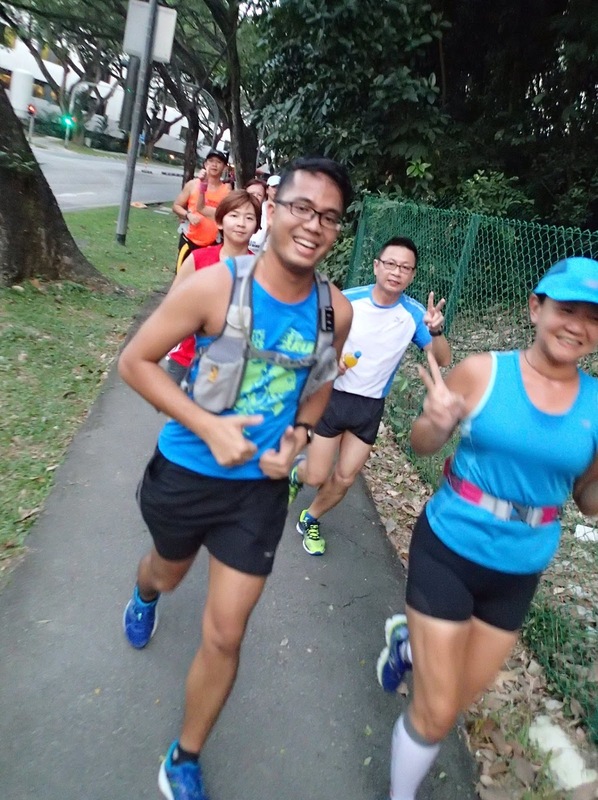 Jason Cai (Grp 202)Thank you Team Fatbird and Caryl for all the motivation and guidance throughout this period! 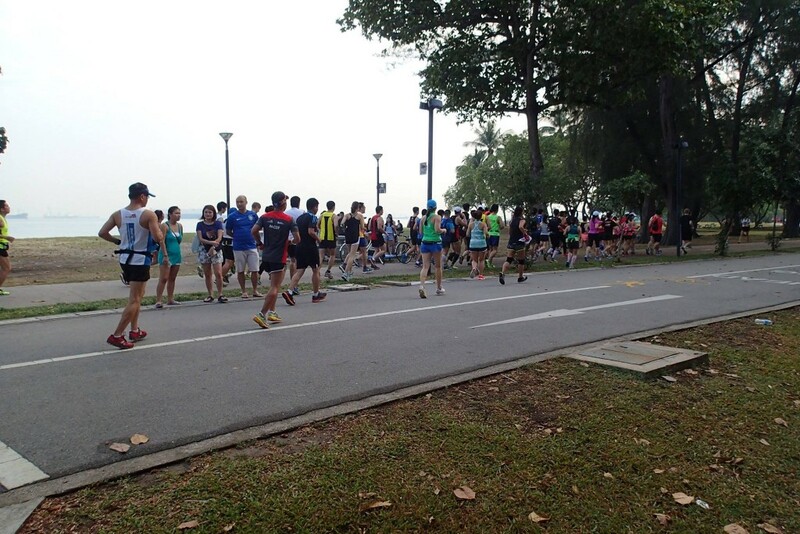 And of course everyone of you who has work so hard to lose weight! Keep our healthy lifestyle ya! 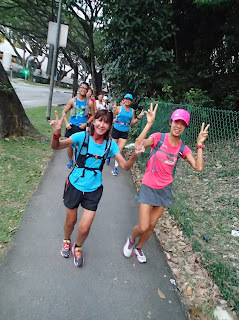 Kim & Chew (Grp 206)In the past, we have little success losing any weight. After we joined this LTW program organized by Team FatBird, we manged to lose 2.4kg and 3kg respectively. 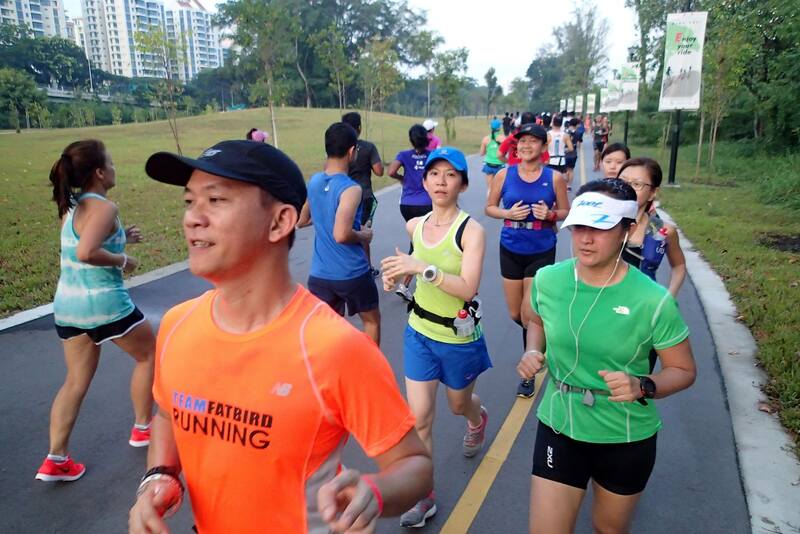 We wish to thank Team Fatbird, its trainers and crew for journeying with us through this 8-week program. 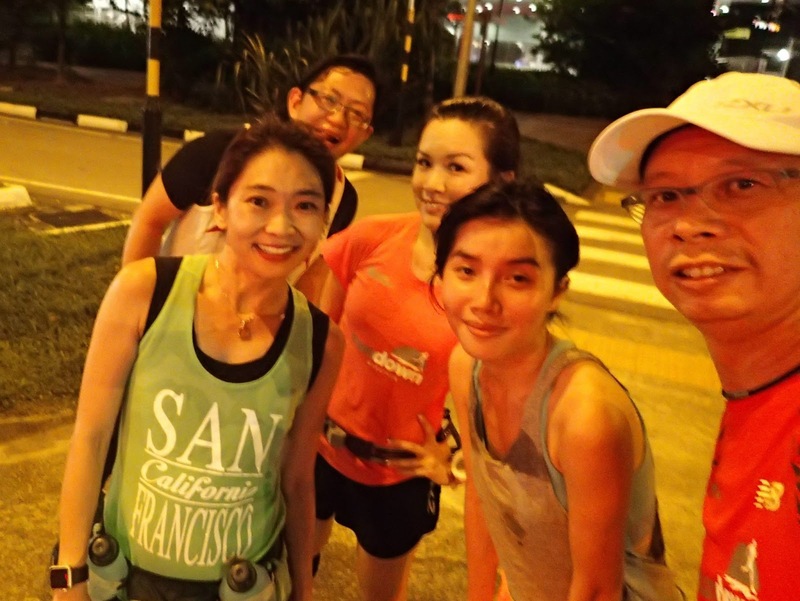 Margaret Teo (Grp 206)Prior to this LTW program, I was already working out 5 times a week but without much improvement in my weight. After signing up the LTW program, I was delighted by my 4kg loss in just 8 weeks. 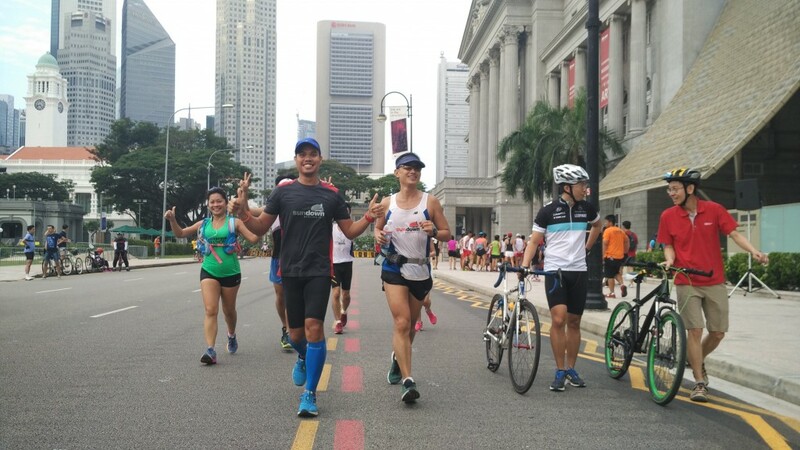 I thank the trainers, nutritionists and especially Team Fatbird for their dedication and hard work in helping to get me motivated with those highly energetic exercises and proper eating habits that have helped me. 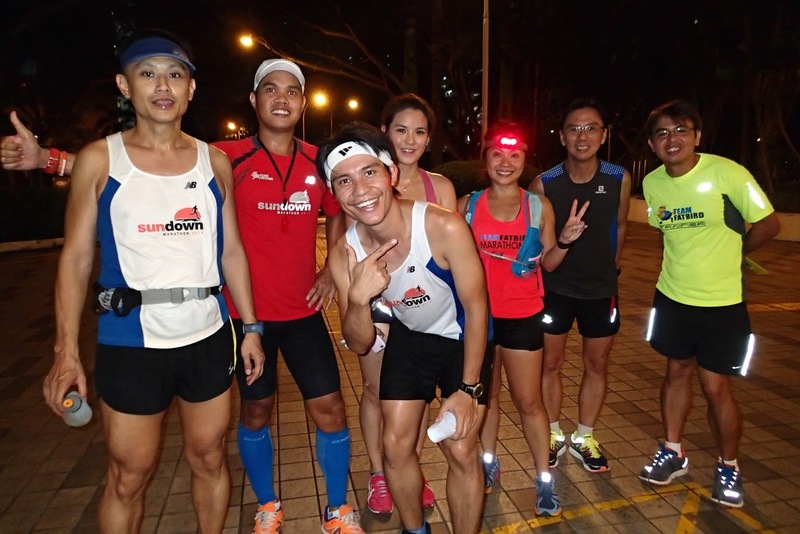 It was the longest night training run for the NightHawks and Falcons, who made their way to the start point at SAFRA Mt. 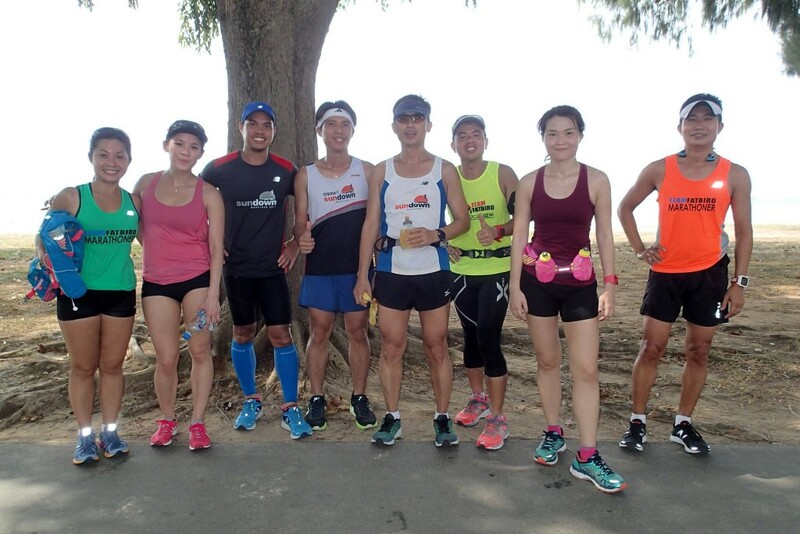 Faber. 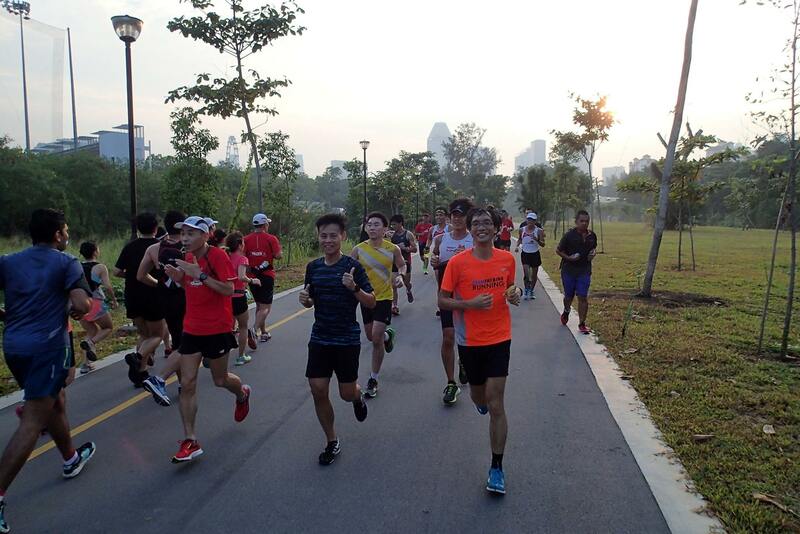 The Falcons who were in week #9 were scheduled to complete their longest run of 21km (HM) and 35km (FM) while the NightHawks were into week #3 of basebuilding and conditioning for the night. 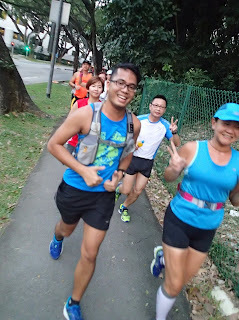 We started promptly and headed to Labrador Park for the 6km loops around Keppel Marina and Labrador. 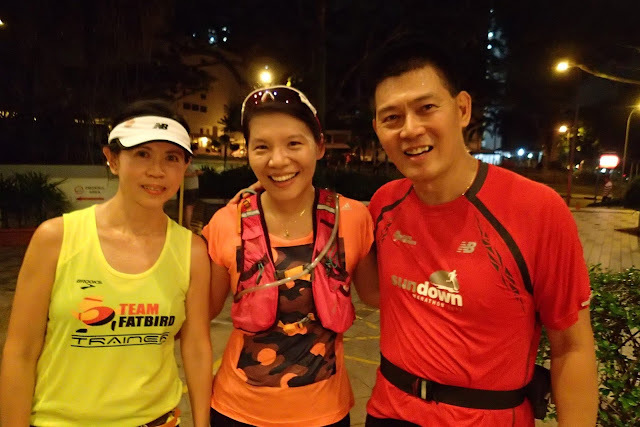 The windy night offered some respite for the runners as we paced one another in our respective groups for the demanding workout session. 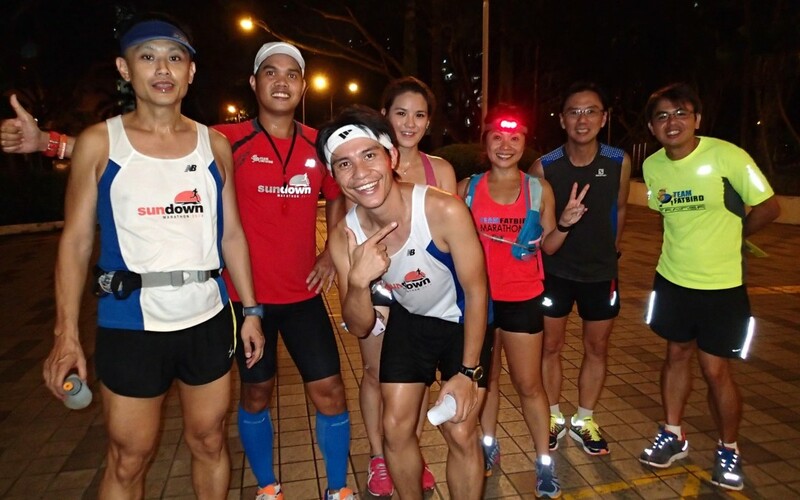 The serenity of the night was only broken by the occasional cheers of FatBird groups running past one another and when we run past the Happy Group with their nice music playing through one of the mini speakers. 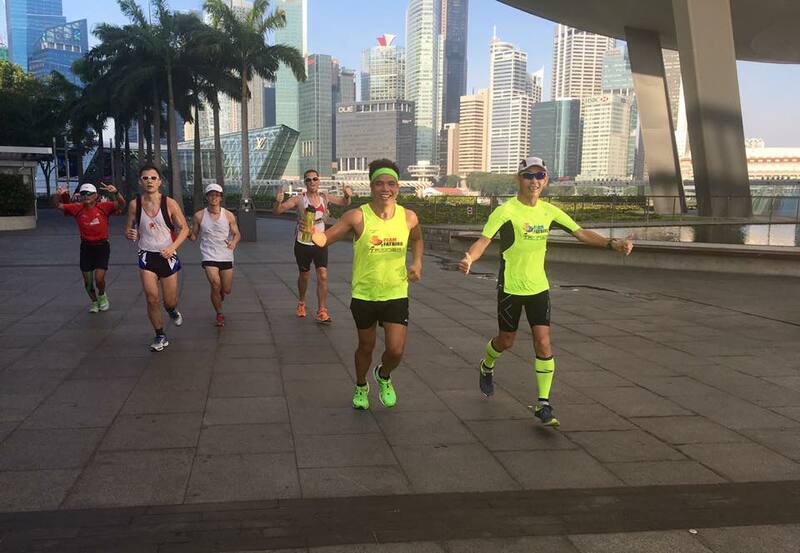 The pace were manageable for the first half of the training, with the Falcons moving to Optimal Pace in the second part of their run. 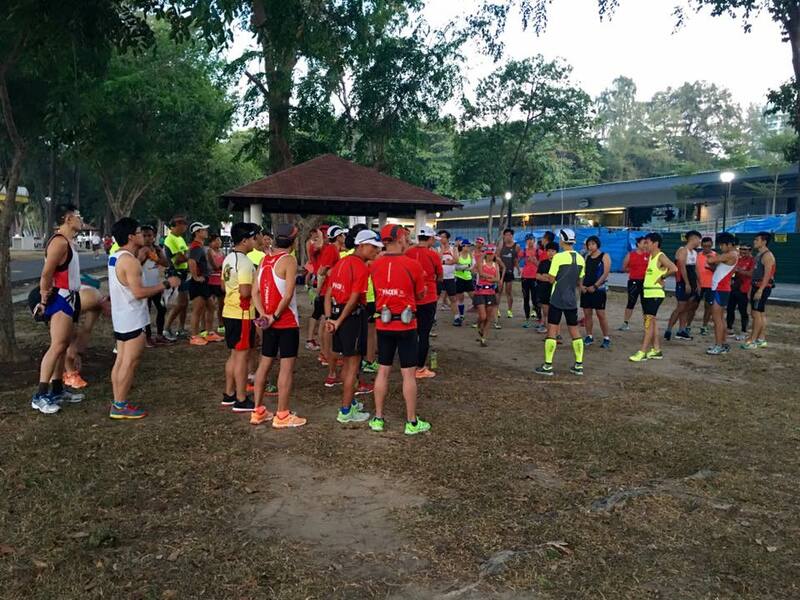 A test of their fuel plan was the order of the day as a number of trainees who had too little for dinner found themselves fatiguing after 15km of running. Still, the motivation of training in pace groups helped them to persist along to complete the requirements of the night run. All the participants did well to complete their training by 10:00pm, with ample time to spare for a quick change and catch the transport home for a nice hot bath and stretching out those tired legs. 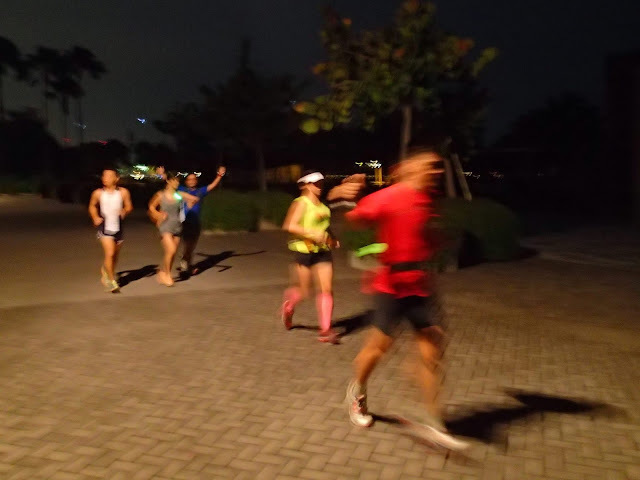 The NightHawks and Falcons came away with a number of lessons of night running, chiefly in the areas of visibility and perception of distances and paces, fueling and hydration requirements, as well as the relatively humid conditions of the night.